Lauren is a mathematics and biology double major at Colorado College. She thanks NOAA ESRL's Carbon Cycle Greenhouse Gases group, and the Stable Isotope Laboratory and the Radiocarbon Laboratory, both at INSTAAR (University of Colorado), for their help in creating this website. This project was made possible through the National Oceanic and Atmospheric Administration's Ernest F. Hollings Scholarship Program. Ever since the early 1960s, atmospheric scientists have known that carbon dioxide levels in the atmosphere are on the rise. We know that this increase is caused by burning of fossil fuels - coal, oil and natural gas - which emit carbon dioxide into the air. Yet only about half of the carbon dioxide produced each year from fossil fuels remains in the atmosphere. The rest is absorbed by the oceans and land plants. Even with this wealth of knowledge, scientists have more to discover about carbon dioxide levels in our atmosphere and its interactions with the oceans and land. 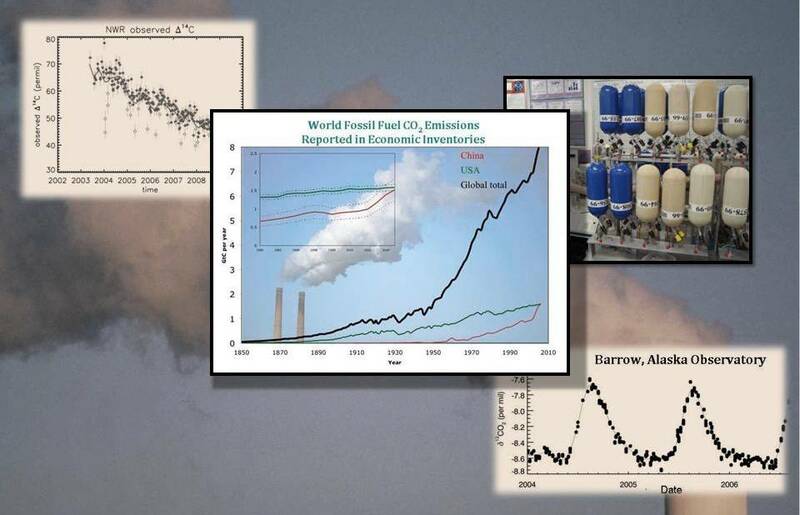 How much of the carbon dioxide in the air comes from fossil fuels? Where in the world is the carbon dioxide from fossil fuels coming from? How much is coming from each region? How much of the added CO2 goes into the oceans, and how much into the biosphere? Which parts of the biosphere are absorbing CO2, and why? Are some parts of the biosphere releasing CO2 to the atmosphere? How much carbon dioxide is added to the atmosphere from deforestation? Is this offset by increased plant growth in other parts of the terrestrial biosphere? How much carbon dioxide is being absorbed into the ocean? Which parts of the ocean are absorbing the carbon dioxide? What other effects may this have, such as the ocean becoming more acidic 1? Answering these questions will help us to understand what might happen in the future as CO2 levels continue to rise. Will these surface reservoirs “fill up” and no longer take up the extra CO2, leading to an even faster rise in CO2 in the atmosphere? Could we discover ways to increase the amount of CO2 taken up by these surface reservoirs, and thus reduce the amount of CO2 in the atmosphere? To answer these questions, scientists at NOAA's Carbon Cycle and Greenhouse Gases Group use measurements of greenhouse gases and their isotopes. To truly understand the role of carbon dioxide in our atmosphere, and how we, as humans, may be altering our atmosphere, we have to look at the entire carbon cycle. 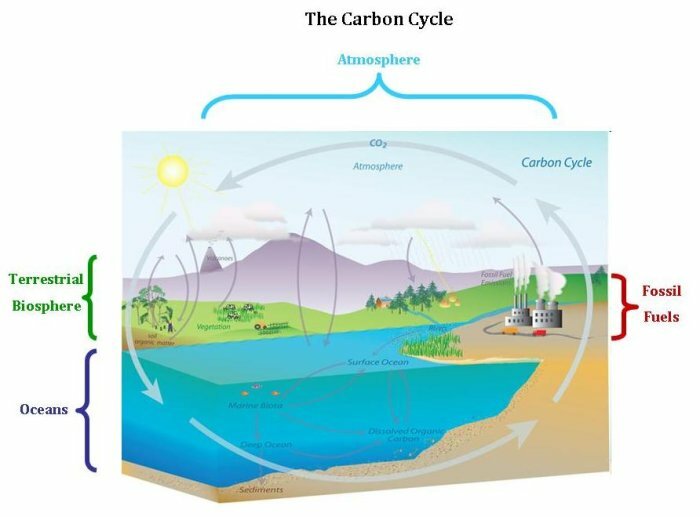 The carbon cycle describes and quantifies the movement of carbon through different reservoirs on Earth. While carbon is exchanged in both directions between the terrestrial biosphere and the atmosphere and between the ocean and the atmosphere, there is only a one-way movement of carbon from fossil fuels to the atmosphere. The last two reservoirs depicted in the diagram above–the terrestrial biota and the ocean–can be further classified as net sources or net sinks of atmospheric carbon dioxide. While sources are components that add carbon dioxide to the atmosphere over a long period of time, sinks take in, or sequester, atmospheric carbon dioxide. Note that scientists add the term “net” before source or sink. This is because carbon dioxide is exchanged both ways in the terrestrial biosphere and the ocean. In other words, using the ocean as an example, carbon dioxide is constantly both entering and exiting the ocean. Using the term “net sink” tells us that more carbon dioxide enters the ocean than leaves the ocean. The same is true for the terrestrial biosphere. Net sources of carbon dioxide have a positive (+) sign in the chart above, while net sinks have a negative (-) sign. 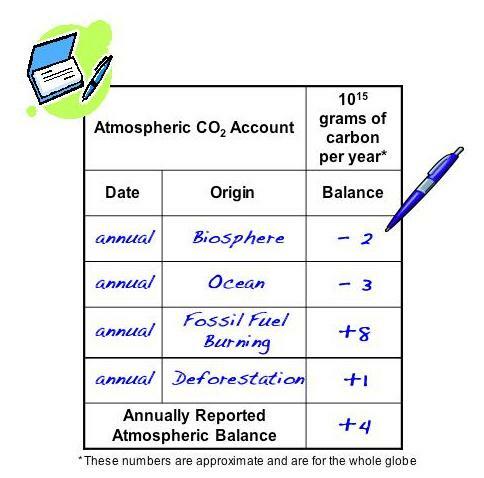 Total, when you add up all of the carbon entering the atmosphere and subtract all of the carbon leaving the atmosphere, you find that more carbon dioxide is added to our atmosphere each year. However, without net sinks, this value would be twice as large! How can we distinguish between the different sources and sinks of carbon dioxide? Carbon dioxide, or CO2, contains the key piece of information within the carbon atoms themselves. Although it may seem that a carbon atom is just the same as every other carbon atom out there (perhaps they appear to all be clones of each other–where each looks and acts exactly the same), this is not the case. 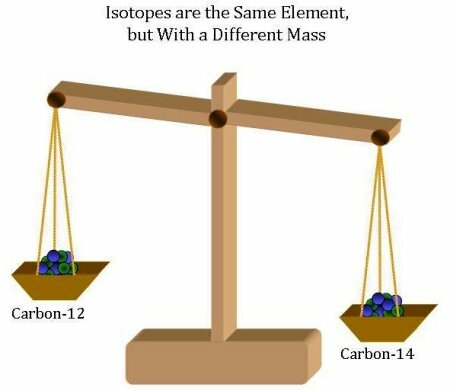 In fact there are three isotopes of carbon atoms - all three react the same way in chemical reactions–the only chemical difference between them is that they have slightly different masses. The heaviest is carbon-14 (which, in the scientific world, is written as 14C), followed by carbon-13 (13C), and the lightest, most common carbon-12 (12C). Different carbon reservoirs “like” different isotopes, so the relative proportion of the three isotopes is different in each reservoir - each has its own, identifying, isotopic fingerprint. By examining the isotopic mixture in the atmosphere, and knowing the isotopic fingerprint of each reservoir, atmospheric scientists can determine how much carbon dioxide is coming and going from each reservoir, making isotopes an ideal tracer of sources and sinks of carbon dioxide. Learn more about isotopic and atomic chemistry. As an example of these isotopic fingerprints, and how they can help scientists, consider this: fossil fuels do not contain 14C. By studying how the concentration of 14C has changed in the atmosphere, scientists have determined that the atmospheric increase in carbon dioxide is dominated by fossil fuel emissions. While terrestrial plants “dislike” 13C, ocean exchange does not prefer 12C or 13C. This creates a difference in the relative ratio of terrestrial versus oceanic uptake of atmospheric carbon dioxide isotopes. Since isotopes are able to tell us so much about Earth's atmosphere, it may come as no surprise that they are useful in a multitude of other fields as well. Have you ever heard the saying, “You are what you eat?” Well, isotopes validate this saying. By finding the carbon isotopic composition of a hair sample (other samples, such as fingernails, work well too), it is possible to determine what percent of your diet comes from wheat or corn, since corn has more 13C relative to wheat. Nitrogen isotopes even give away your vegetarian, omnivore, or carnivore preferences. All that information in just a small sample of hair!